As we know options is a derivative instrument and Call and Put are two types of options. To know more about, call options, refer the call options article. Here, we’re going to emphasis on put options. Buying a the Put option gives buyer an option to “SELL” underlying asset at strike price with an expiry date on this contract. So buyer of a put option expects price of an underlying asset to go down and therefore seeks to protect the downside risk or profit from the downside. A classic example of a put option in common business is that of an underwriting contract. In an underwriting contract, the underwriter (similar to a put option seller) is obliged to buy at a certain price if the demand and price of the underwritten asset is lower than the agreed price. In such a case, the owner of the underlying asset has the option to sell his asset to the underwriters at a fixed price. This option to sell exercised by the asset owner is nothing but an exercise of the put option. How are put options different from call options? The fundamental difference between put options and call options is that put options give the buyer a RIGHT TO SELL the underlying asset whereas call options give the buyer a RIGHT TO BUY the underlying asset. One can trade put options in lots only. In India, we have adapted European Options style, Expiry date is fixed viz. last Thursday of the month (in case Thursday is a trading holiday previous working day). In the money put option – when the current market price of underlying asset is less than the strike price. At the money put option – when the current market price of underlying asset and the strike price are identical. Out of the money put option – when the current market price of underlying asset is more than the strike price. Just for reference, let’s assume share price of ABC Company is Rs. 100 and lot size of 50 units. Trader A has bought a put option of an ABC company of 100 strike price (agreed upon price). Now if on the day of expiry share price of ABC Company closes below Rs. 100. Buyer is in profit. As we trade Put option or any other stock market instrument with the sole purpose of making money. Important thing to understand is Payoff. Payoff and Profit isn’t the same thing. Pay off means premium of the desired option at the time of expiry. For calculating Profit, one needs to take investment from payoff. E.g. Trader A has bought a put option of 100 strike price of ABC Company at Rs. 2. Premium of ABC Company at the time of expiry is 10 then, Payoff will be Rs. 10 but profit will be Rs. 8. In the case of option writer (seller), if call expires below strike price meaning worthless then payoff is what he collects in terms of option premium. Value of Put Option = (Strike Price – Price of underlying) OR Zero, whichever is higher. Naturally, if the price of the underlying is greater than the strike price on expiry day, the value of the put shall be zero. A Put gives buyer an option to “sell” underlying asset at an agreed upon price with an expiry date on this contract. Whereas, Call gives buyer an option to “Buy” at agree upon price with an expiry date on this contract. Put buyer would want prices of the underlying to fall and call buyers would like to see prices of underlying surging. A put buyer makes profit when price of an underlying asset is less than the strike price at expiry. A Call buyer makes profit when price of an underlying asset is more than the strike price at expiry. You can get a complete visualisation of options payoffs on the SAMCO Option Payoff Value calculator. There are some popular put option strategies. In Long put strategy, trader buys a put option of an underlying asset (generally equity) which is already in his portfolio, this strategy acts as hedging. In Bear Spread strategy, trader creates a spread by buying out of the money put option and selling in the money put option. As they say, in trading most important thing is price. Likewise while trading put option one must keep in mind what is fair value of put option? To check the fair value check SAMCO’s Option value calculator. While trading put options, its also important to bear in the mind the other costs associated which include brokerage and other transaction related expenses. To calculate the options brokerage and transaction related expenses for trading put options, check out the brokerage calculator. 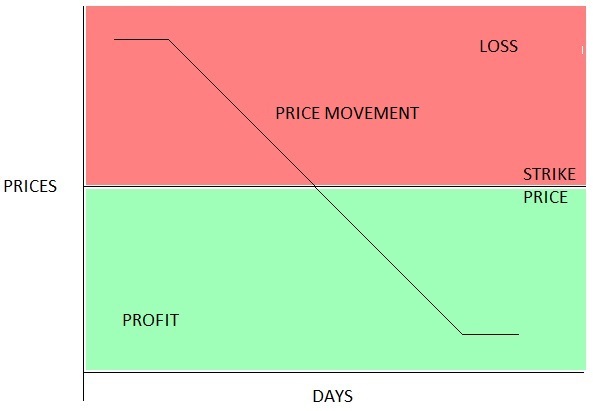 Risk – Reward – Maximum Profit is restricted to the premium, whereas the loss can go up to the strike price of the underlying in case the asset goes to zero. Very good post, i was really searching for Put & Call options topic as i wanted this topic to understand completely and it is also very rare in internet that is why it was very difficult to understand. thank you for sharing this.